Depending on the location, there are different methods of accomplishing the surgical exposure of your tooth. If the impacted canine is close to the palate, your dentist will have two options depending on the exact position of the tooth. 1. 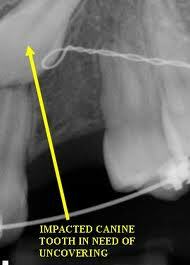 Gaining Access into Impacted Tooth/Teeth. 3. 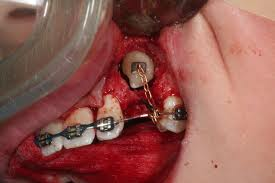 Impacted tooth/teeth traction by elastic chains/ligature wire. 4. 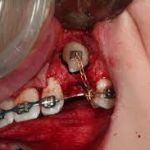 Button “if existed” is replaced by a bracket; the installed bracket on the impacted tooth/teeth is/are attached directly into the arch wire. 5. Tooth/teeth is/are completely erupted and “Braces” Removed. position. Once your orthodontic treatment is completed, minor recontouring of your gums may be necessary. The closed eruption technique is believed by some to be the best method of uncovering labially impacted teeth, especially if the tooth is located high above the mucogingival junction or deep in the alveolus where an apically positioned flap may be difficult or impossible to use successfully. 3. Traumatization of nearby structures. 4. “Collision” with the adjacent roots. This entry was posted in Oral Surgery, Orthodontic, Periodontics and tagged braces, canine, closed exposure, cyst formation, deciduos tooth, gums, open exposure, orthodontic brackets, palate, surgical exposure of impacted tooth on May 14, 2012 by chzechze.